This tour, by motorbike, mountain bike or tuk tuk (local transportation), brings you to rubber and cacao plantations where you can see how both of the products are grown, processed and used. You will also visit two small ‘factories’ where tofu and brown sugar are made, after which we will drink fresh coconut. Enjoy a real spicy Indonesian lunch, consisting of rice, (vegetable)curries and meat/fish in a ‘warung’ (traditional café/restaurant). 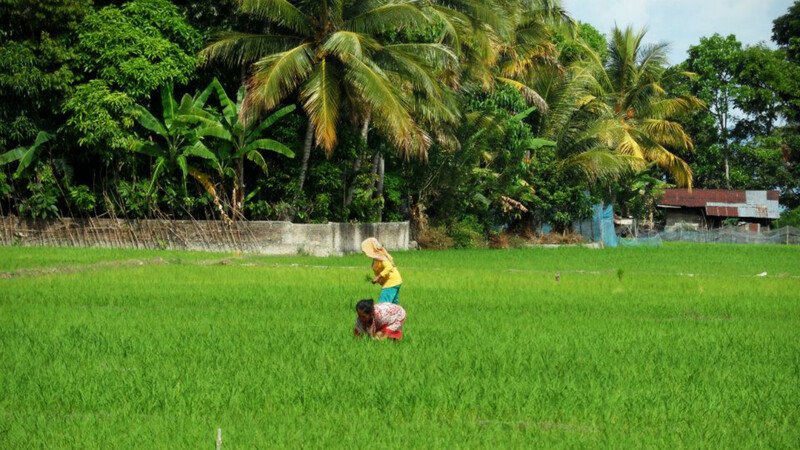 Try to eat like locals, not with a spoon or fork but by hand..
After lunch you will visit some rice paddies and learn how rice is being grown and processed. We also visit a local school and market. This tour gives a great impression of how people live, work and eat. While driving from one place to another, do not forget to enjoy the beautiful landscape and amazing views.